Since LAP is an all volunteer group, we rely on the dedication of volunteers to operate the Grateful Paw Cat Shelter and work with the dogs at the Town of Huntington. There are many volunteer opportunities available with the cats, with the dogs, for fundraising and on the business and marketing side. Want to do more to help shelter dogs and cats? Join the League for Animal Protection of Huntington as a volunteer. You’ll be glad you did! 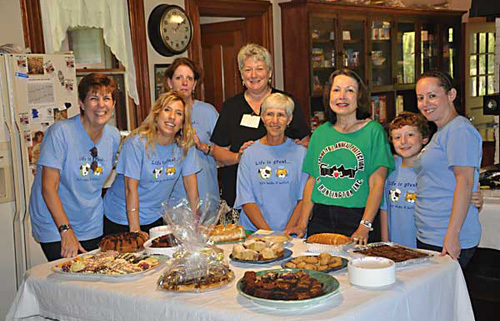 Grateful Paw Cat Shelter operates 100% on the efforts and dedication of our volunteers. It takes hundreds of hours a week to keep our cats and kittens happy and healthy. Your help is vital. Caretakers  Clean the shelter and feed the cats. Cleaning and feeding is done twice a day, every day, 365 days a year. Cleaners work in teams and each team decides how they want to divide up the various chores. We pride ourselves on the cleanliness of our shelter and know that a clean shelter not only encourages visitors to come and adopt from us but also helps maintain the physical and mental health of our cats. Office workers/adoption counselors  Working 4.5 hour shifts, office workers answer phones, fill out paperwork and most importantly, introduce visitors to their new best friend. Hours are Tuesday-Friday 12:30p-4:30p and Saturday/Sunday 12p  4p. Office workers are expected to come in 30 min prior to the shelter opening to prepare for visitors. Weekday office workers work the same day each week. Weekend office workers work one or more weekend days per month. Please contact us to learn which days we are currently in need of additional help. Foster Parents  During kitten season (spring/summer/fall), we have a need for people to take into their homes kittens under three months of age. Foster parents raise the kittens, feeding, socializing and preparing them for life as family members. LAP provides food, supplies and medical care. Foster parents must agree to bring their kittens to the shelter on vet nights at appropriate intervals for health checkups, shots and finally spay/neuter. We are also in need of experienced foster parents to take care of bottle babies as well as nursing momma cats and their kittens. Bottle babies are those kittens under seven weeks of age who are not yet eating on their own and must be hand fed. Socializers  Come in during the hours Grateful Paw is open. Socializers pet, brush and clip nails on our cats. They work with the shy cats to bring out their best side. Dog volunteers go into the Town of Huntington Animal Shelter and walk, play with and socialize the dogs residing in the shelter. It is a fabulous way to not only get exercise for yourself but also provide a dog with mental and physical stimulation so vital to them. Dog volunteers are permitted into the shelter during open hours (Monday-Friday 8am - 6pm and Saturday/Sunday 9am-4pm). Volunteers are not permitted in the shelter building outside these hours or on holidays when the shelter is closed to the public. If working hands on with the animals does not fit your schedule, we also need people to help with fundraising events. There are many ways you can help. Just contact us for further information. Training is provided for all volunteer positions. All volunteers working directly with the animals must be 18 years old or older and be willing to sign a waiver. For some positions, physical ability may be required including, but not limited to, lifting, bending, reaching up, etc. Some positions may require specific time/date requirements while other positions may be more flexible. If you would like to volunteer with the cat program, fundraisers or publicity. click here for the application. Print it, fill it in and mail it to LAP, PO Box 390 , Huntington , NY 11743 , Attn: Volunteer Applications. A representative will contact you upon receipt to discuss the options. If you would like to volunteer with the dog program, email volunteers@LAPHuntington.org to obtain further information. Two different applications must be filled out and you must attend an orientation prior to working with the dogs.